The regatta is over for this year, but we are looking forward to February 2020! A big thank you to all our volunteers, coaches, US Rowing referees, participants, NBP staff, vendors, and viewers to help make this another successful regatta. A big thank you to our sponsors. Sponsorship of this event supports not just local rowing but the rowing community as a whole. The 10th annual Sarasota Invitational Regatta was held at Nathan Benderson Park, Sarasota, Florida, site of the 2018 Masters World Rowing and the 2017 World Rowing Championships. Middle schoolers competed the afternoon of February 22, Juniors all day on Saturday the 23rd and Masters rowers on Sunday the 24th. The Rowing for Life event took place on Saturday. 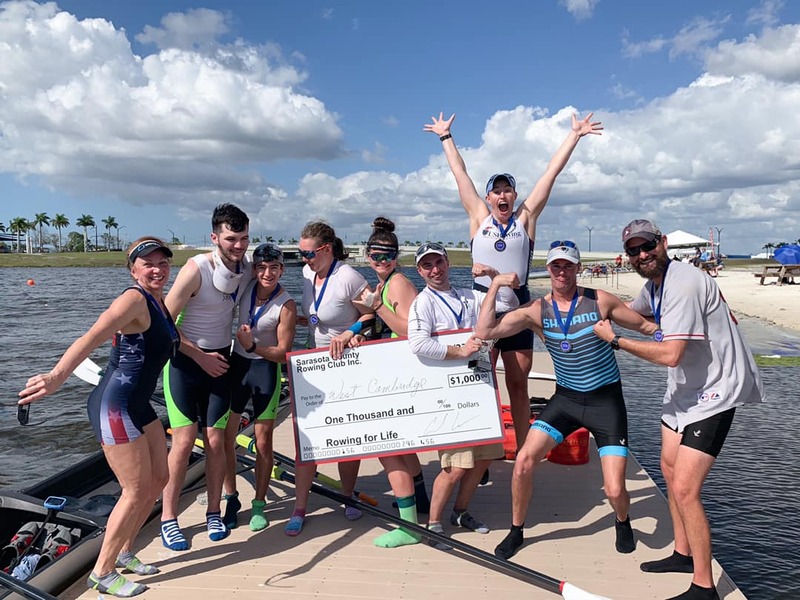 Rowing for Life is a mixed 8+, youth and masters competing for a cash prize ($1,000) which went to West Cambridge Rowing and Lake Brantley. Contact Norm Thetford for more information. This is a highly competitive race. You want to start planning now for 2020!